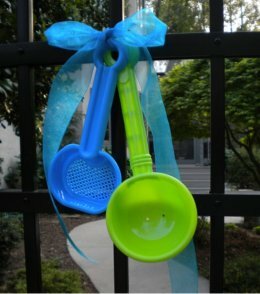 Pool party decorations can be simple and inexpensive, yet they can turn an ordinary party into an extraordinary, memorable event. The most important tip for decorating around your pool is to use color. Colorful potted plants of geraniums, blooming gardenias, or bouquets of store bought flowers should surround your guests with color and fragrance. Colored paper lanterns add a festive touch as swimming pool decorations. Keep a consistent color combination - using the same colors for your invites, paper goods, flowers and pool decorations. 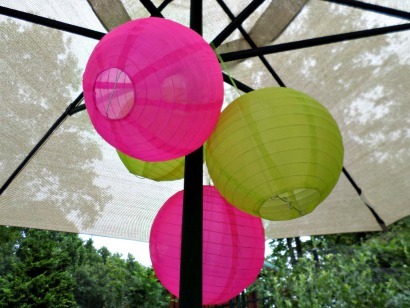 Hang colored paper lanterns on the garden arbor, on tree branches, or from the ribs of the outdoor umbrella. Choose a color theme and repeat it in the table setting, the paper lanterns, and any other swimming pool decorations that you use. 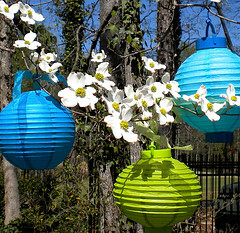 Colored lanterns provide lots of color while the sun is up and great pool party lights for when the sun goes down. 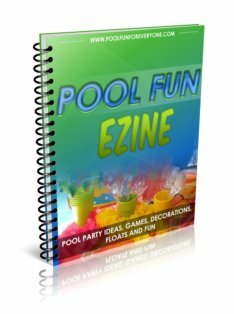 Consider using a pool party theme for your next swimming pool party. The theme will give direction to your invitations, food, the color theme and the decorations. 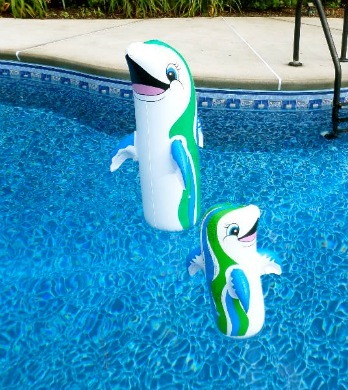 This summer we had a dolphin pool party. Floating dolphins greeted guests by the gate and in the swimming pool. We bought a bubble machine to use at one of our pool parties, but it kept showing up out by the pool all summer. I don't know if it was the combination of the two but it worked great. Lots of good bubbles. They come in just about every shape - from dolphins and dinosaurs to whales and palm trees. For an evening party set out lots of lights - on the path to the pool, on any steps, and around the perimeter of the pool. 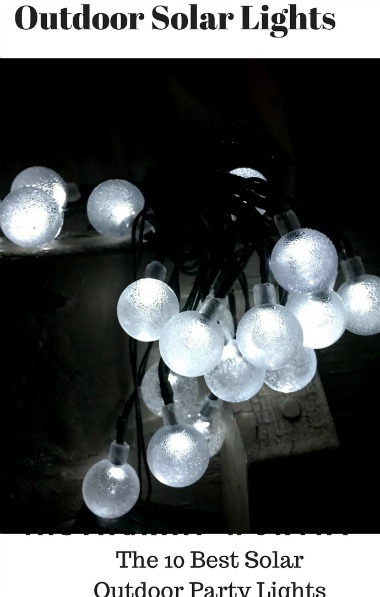 Outdoor party lights are an inexpensive way to make sure that there are no dark areas. 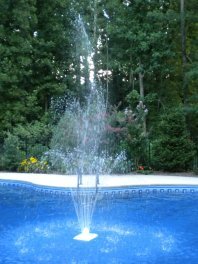 Swimming pool fountains provide a source of a refreshing visual delight and a calming sound of splashing water. They can be easily installed and removed. We use a floating pool fountain that sits in the middle of our pool. 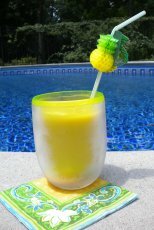 They are great pool decorations for daytime parties or get a lighted fountain for evening entertainment. 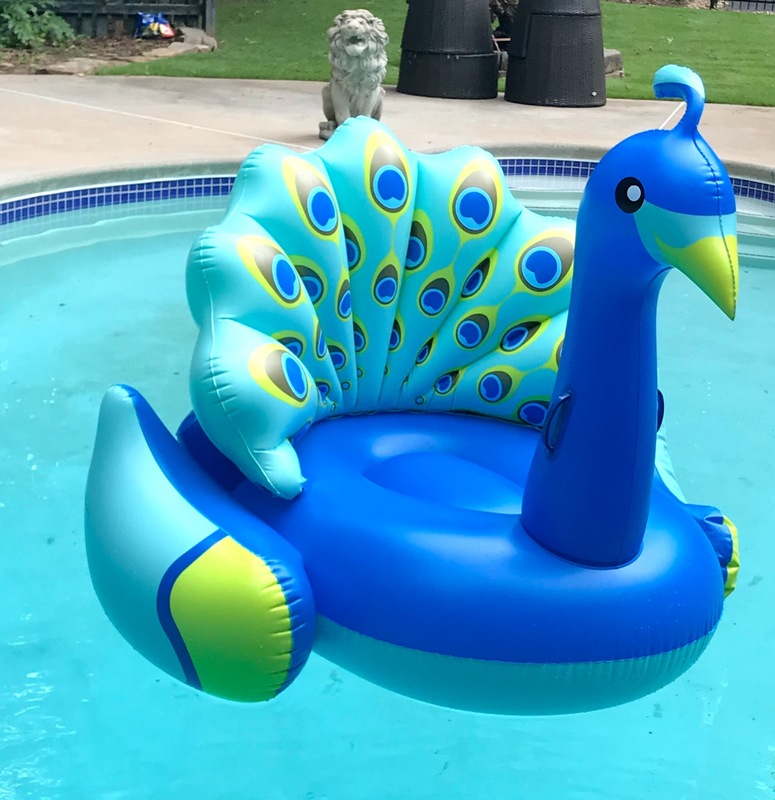 The soothing splashing sound and the refreshing site adds to any pool party ambience. Bouquets of blue hydrangeas look fabulous in these yellow buckets. 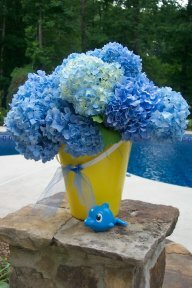 I put large bouquets of them on the steps to the pool with a touch of blue netting tied on the handle. 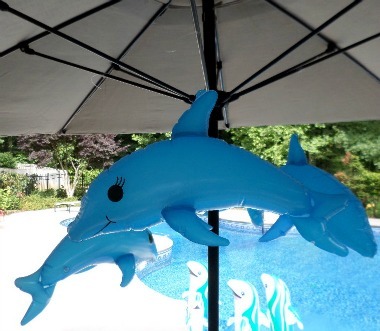 Sitting alongside the bouquet is a blue dolphin pool toy. More bouquets were placed by the pool gate and at the tables. When decorating for a pool party not only should repeat the same color scheme - but repeat the same flowers as well. The flowers on each of the tables or wherever you use them should be similar in style and color. I promise to use it only to send you Pool Fun Newsletter. All rights reserved. This DMCA site is protected under U.S. and International copyright laws. Do Not Copy and Content or Images. No use is permitted without written permission.